19th PanAmerican Congress Thank You from President Carolina Avaria. On March 7th the Canadian National Board arrived in Montreal for two days of meetings leading into what would become an INCREDIBLY MEMORABLE 19th Pan-American Congress. Our seven united regions focused on collaboration as we tackled new and old challenges, prepared to legally register our Association as Not for Profit and lead the country into celebrations of our 40th Anniversary! Day 14 – 1991: At the Montreal Congress, new Members received their Keys from Jean Gillet! 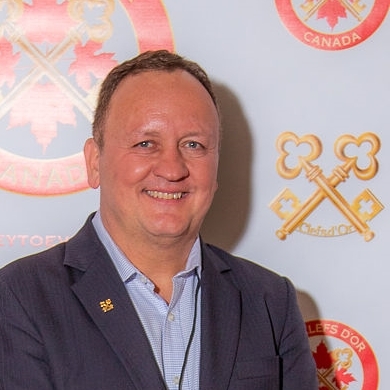 40 Years in 40 Days; The History of Les Clefs d’Or Canada. Part of the 40th Anniversary celebrations that will continue throughout 2016. In July 1991, the city of Montreal was host to the 2nd National Congress with the Montreal Region Director, Mr. Georges Bouissière, as the Congress Chairman. The highlight of this event for seven new members was certainly when they received their Golden Keys from International President Mr. Jean Gillet, the son of Les Clefs d’Or – UICH’s founder, Ferdinand Gillet! Today, we reached 10,000 hits on the Blog! Thank you to all our Followers and Contributors! In September 1975, 6 Concierges from 6 of the best hotels in Toronto decided to create the Association Les Clefs d’Or Canada and met for the first time, at the Rothman’s Car Museum, to discuss various subjects pertaining to Les Clefs d’Or and to the Concierge profession.